Advocates for Catholic schools are praising an Illinois education bill expected to be signed into law by Governor Bruce Rauner on Thursday. It includes the creation of a tax credit scholarship program that could funnel much-needed revenue to Catholic schools in that state—though critics note that it also reduces revenue to a state currently wrestling with a debt of $14 billion. “The greatest social justice issue of our time is access to a quality education for the economically disadvantaged, and this legislation goes a long way toward addressing that need,” Robert Gilligan, executive director of the Catholic Conference of Illinois, told America. The program works by giving individuals or corporations who donate to scholarship-granting organizations a 75 percent tax credit on donations, worth up to $750,000. Under the law, up to $75 million in credits will be granted annually starting next fiscal year. The program will expire after five years unless lawmakers extend it. Proponents say the program will help to provide scholarships for 6,000 to 10,000 students in religious and other private schools statewide. These scholarships must go to households with an annual income below 300 percent of the federal poverty level, or about $73,000 for a family of four. According to the National Catholic Educational Association, Illinois is home to 439 Catholic schools serving 135,000 students. Cardinal Blase Cupich, Chicago’s archbishop, had lobbied the governor and lawmakers to support the measure, and earlier this year he expressed his support for a similar program at the national level in an email to Chicago Mayor Rahm Emanuel, WBEZ reported. Both the governor and the mayor traveled to Rome last year to celebrate the archbishop’s elevation to cardinal. When the governor signs the bill Thursday afternoon, Illinois will become the 18th state to enact a tax credit scholarship program. Most of those states have been traditional Republican strongholds, with programs in New Hampshire, Pennsylvania and Rhode Island as the exceptions. But there has been movement in Democratic bastions as well. New York Gov. Andrew Cuomo has partnered with Cardinal Timothy Dolan to support a similar measure there, but so far they have not found success in the Legislature. Jennifer Wagner, vice president of communications for the school-choice organization EdChoice, dismissed the notion that school choice is a Republican issue. She told America that the new program in Illinois is the result of Democrats and Republicans willing to compromise on a contentious issue. At the federal level, President Trump has said he supports a national tax credit scholarship program worth up to $20 billion, but there has been little movement on the issue in Congress. Teachers' union leader: “This component creates a $75 million hole in the state budget and robs our public schools of students and resources." Teachers’ unions and some Democratic lawmakers opposed the scholarship program in Illinois, saying it would divert public money from public schools. “This component creates a $75 million hole in the state budget and robs our public schools of students and resources,” Dan Montgomery said. The Illinois scholarship program is part of a massive, bipartisan overhaul of how Illinois funds its schools. Besides distributing state aid more equitably, the long-sought deal the legislature approved this week gives districts more flexibility on state mandates and allows residents in well-funded districts to reduce their property taxes. 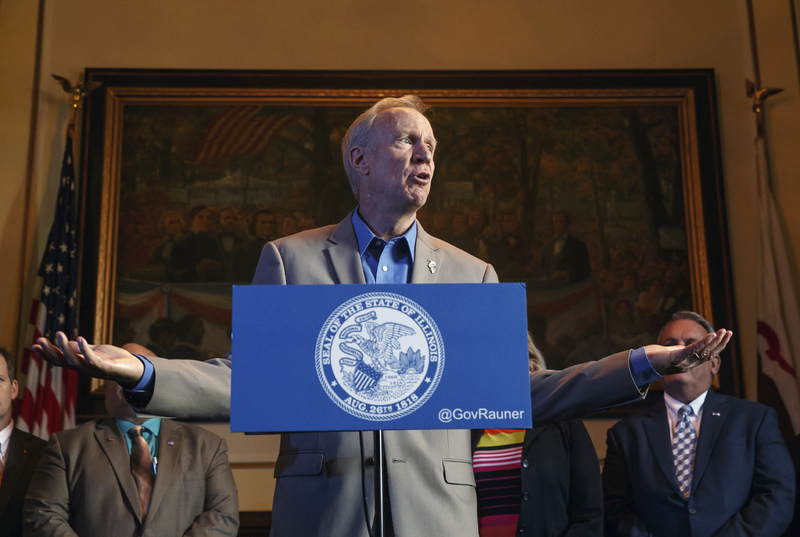 Mr. Rauner said the changes will ensure every child “gets a chance at an excellent education regardless of their parents’ income” or where they live.